For the fans of open source and all the developers, you can now program your QT4 software using an advanced developer platform: "Eclipse". Eclipse is well supported when using java coding. And recently Trolltech developed their own plug-in so that you could program on the platform using QT4 libraries and designer tool. 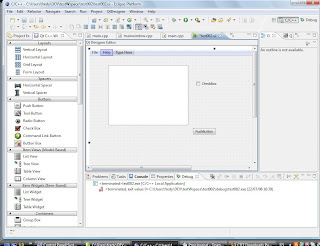 As eclipse is based with Java it is platform independent and can run under linux or windows. Offcourse there is few setup to go through, but it is quite easy to install. (remember to add to the PATH the "C:/qt/4.4.0/bin/" and "C:/MinGW/bin/"
It runs with QT4 and the MinGW libraries. I used to program with eclipse before under Java coding, and I will say that it is not as good using the Qt4/c++ but is much better than the "text editor" way. the debugger is still not working (at least with my setup) and "control+over" help is still not as good as for the java libraries. It gives you a very good view of your program code and it much easier to navigate through your code. Well done Trolltech. Continue the good work.